With it would appear, a weekly bus rollover, the powers that be here are pointing the finger at the double-deckers to cut down the road toll. However, in the US, the National Highway Traffic Safety Administration has (NHTSA) had it legislated that ESC (Emergency Skid Control) must be fitted to buses. 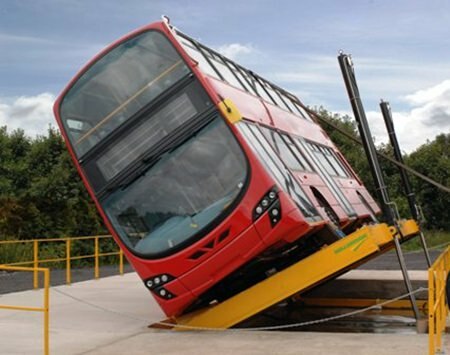 It was said that Emergency Skid Control (ESC) in buses could reduce rollovers by 84 percent, preventing between 5,300 and 9,600 deaths annually and up to 238,000 injuries a year once all vehicles are equipped with it. Around 10,000 people a year die in rollover accidents, even though just 3 percent of crashes involve rollovers. NHTSA noted that two types of stability control systems have been developed for heavy vehicles. A roll stability control system is designed to prevent rollover by decelerating the vehicle using braking and engine torque control, while ESC includes all of the functions of an RSC system plus the ability to mitigate severe oversteer or understeer conditions by automatically applying brake force to help maintain directional control of a vehicle. Heavy trucks – especially loaded ones – are more likely to rollover because of their higher center-of-gravity height. NHTSA first proposed the regulation in 2012 but has made changes to the electronic stability tests that vehicles will need to pass in the final rule. This is the latest action on larger vehicles by the safety agency. NHTSA is also working on regulations to require speed limiters on heavy trucks and is also reviewing underride guards. It is also looking at whether to require vehicle to vehicle communication on heavy trucks – as it plans to do with cars and SUVs. In 2013, NHTSA finalized long-delayed regulations that will require lap and shoulder seat belts on commercial buses. But the agency decided not to require existing buses to be retrofitted with belts. NHTSA has debated requiring seat belts on motor coaches since 1977. The new rules will take effect in 2016 on commercial buses that typically travel fixed routes between major cities, to tourist destinations and for other commercial trips. The rules don’t apply to school buses and don’t affect the 29,000 commercial buses already on U.S. roads. Seat belts also won’t be required on most public transit buses – those with “request-a-stop systems” – but some public intercity buses that act like commercial motor coaches will need belts. NHTSA is also excluding from the rules airport shuttle buses that transport passengers to parking lots or rental car facilities. What did we learn from the Chinese GP? What did we learn from Malaysia?